Jon Flores/Pipe Dream Photographer Junior pitcher Nick Gallagher struck out seven batters and earned a victory in Binghamton’s first game at Maine on Saturday. 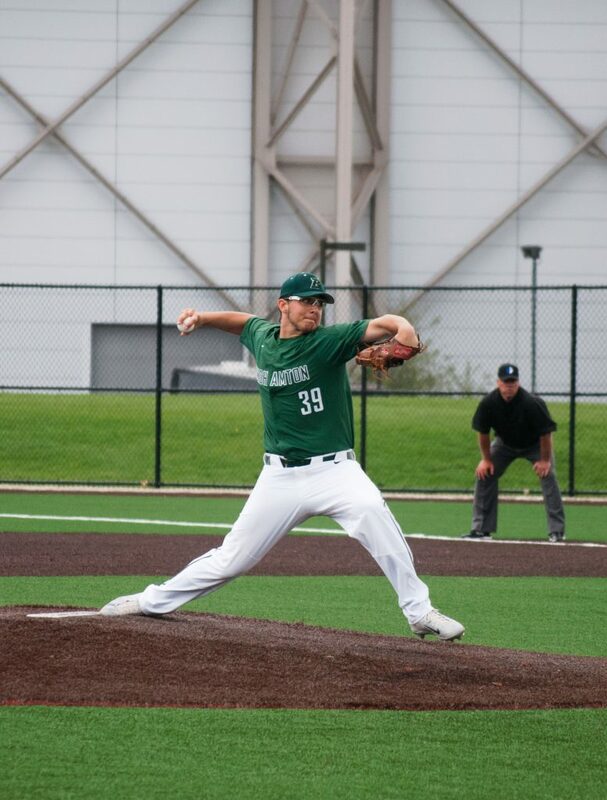 Going into its second-to-last conference series of the season, the Binghamton baseball team desperately needed to pull out at least a couple of victories in order to remain in the playoff picture, as it is slotted to play second-seeded UMBC next weekend. The three-game series in Maine began on Saturday with a doubleheader that the two teams split, with BU (13-28-1, 7-14 America East) winning the first game, 7-4, and Maine (15-28, 9-9 AE) taking the nightcap, 4-2. The Black Bears ended up winning the rubber match as well, 6-1. In the first game, Binghamton jumped ahead to an early lead in the first after senior outfielder CJ Krowiak knocked a leadoff single through the left side of the infield. Krowiak eventually reached third with just one out, and senior infielder Luke Tevlin drove him in with a fly ball to center field that was deep enough to allow Krowiak to tag up. This lone run seemed to be enough for junior pitcher Nick Gallagher, who started the game on the mound. The experienced right-hander tossed six strong, scoreless frames. Gallagher, however, ran into some trouble in the seventh, where Maine plated all four of its runs. Gallagher earned the win for his impressive outing, allowing just one earned run, four hits and one walk while striking out seven Black Bear hitters. Junior left-handed pitcher Robert Brown earned his third save of the season for his 2.1 innings of scoreless pitching. Both pitchers were able to be relaxed on the mound, as senior shortstop Paul Rufo swung a hot bat, finishing 3-for-5 with two RBIs in BU’s seven-run offensive performance. The doubleheader proved to be a tale of two Binghamton offenses. After plating seven runs in the first game, BU was held to just two runs in the second game. Maine came from behind following Binghamton’s early offense, propelling it to a 2-0 edge in the fourth inning. The Black Bears found some late-game momentum and recorded all four of its runs in the fourth, fifth and sixth innings of the seven-inning game. Redshirt senior right-handed pitcher Jacob Wloczewski earned the start on Sunday for the series finale, but junior infielder Jeremy Pena of Maine had nothing but victory on his agenda. The leadoff hitter started the game with a long, fly-ball triple to center field; he then scored on a wild pitch, giving Maine a 1-0 advantage with its second batter of the game at the plate. Senior catcher Jonathan Bennett, who went 2-for-4 with a run and two RBIs, also led the Maine offense. The veteran catcher hit a two-run home run that gave Maine a 4-0 lead and knocked Wloczewski out of the game in the bottom of the third. “At this point, desperate times call for desperate measures, so we have to find a way to compete at the highest level possible this coming weekend,” Sinicki said. Freshman left-handed pitcher Reid VanScoter tossed 4.2 innings of strong relief work. After coming into the game in the third inning with one out, he retired the next two batters in order and stayed on until he was replaced by junior right-handed pitcher Cal Lawrence in the eighth. VanScoter allowed just one hit in his 4.2 innings on the mound. Binghamton is scheduled to return to the diamond this coming Tuesday for a doubleheader at Siena College. First pitch from Loudonville, New York is scheduled for 1 p.m.